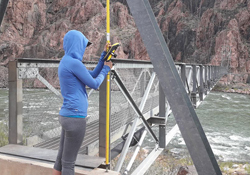 The Geoscientists-in-the-Parks (GIP) program works with partners to match college students and recent graduates age 18 - 35 years old with short-term, paid, internships with the National Park Service. Participants may assist with research, synthesis of scientific literature, geologic mapping, GIS analysis, site evaluations, resource inventorying and monitoring, impact mitigation, developing brochures and informative media presentations, and educating park staff and park visitors. -spend time engaged in one of the most unique, career-enhancing experiences of your life! The application process varies with each partner. Spring and summer positions are typically advertised from December - February, and fall and winter positions from May- June.